Information on the respiratory system and how we breathe. 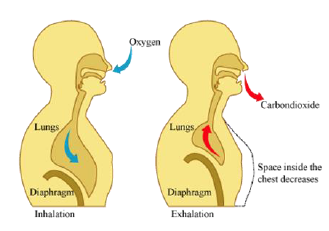 The Role of the Respiratory System is to breathe in oxygen and breathe out carbon dioxide. This is known as respiration. The cells of the body use oxygen to perform functions that keep us alive. The waste product created by the cells once they have performed these functions is carbon dioxide. The respiratory system helps provide a voice. It also assists with the sense of smell and taste. When the diaphragm and accessory muscles contract, your chest expands and pulls air into the lungs; this is inhaling. As your muscles relax, the space inside your chest gets smaller and under more pressure and the air is pushed out of the lungs; this is exhaling – similar to letting air out of a balloon. The cells of the body use oxygen to produce energy. Oxygen is carried by the hemoglobin on the red blood cells. The blood vessels in the lungs bring oxygenated blood to the heart. The heart then pumped it out to the cells of the body. The waste product of this process is carbon dioxide. The hemoglobin then returns the carbon dioxide back to the lungs where it is exhaled. Oxygen makes up 21% of the gas in air. The air is less dense at higher altitudes because there is less atmospheric pressure. This means the oxygen molecules are spread further apart. Less oxygen will enter the lungs with each breath. Atmospheric pressure also helps to push oxygen across the membrane of the cells in the lungs. In Denver, the altitude is 5,280 ft. and we breathe in 17% less oxygen than someone does at sea level. We breathe in 50 percent less oxygen at 18,000 feet. Our bodies adjust to higher altitude by creating more red blood cells. It takes 21 to 28 days for this process to occur. The amount of oxygen needed by the body varies. It will depend on a person’s level of activity, age, weight, and overall health. Individuals who are ill or injured may require more oxygen to help their bodies function and heal. Respiratory Failure: Spinal cord injuries at the C3 level or higher effect the phrenic nerve. The phrenic nerve controls the diaphragm. Individuals with these injuries will not be able to breathe on-their-own and will need assistance from a ventilator. Respiratory Insufficiency: Spinal cord injuries at the level of T6 and higher will affect the accessory breathing muscles. These individuals will have trouble taking a deep breath. This is known as respiratory insufficiency. 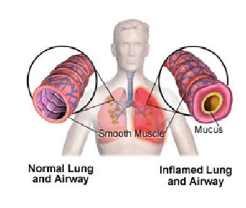 Respiratory insufficiency happens when the body is too weak to fully expand the lungs. These individuals may not be able to bring in enough oxygen or get rid of enough carbon dioxide. Brian Injury: Brain injuries can also affect the parts of the brain that control or regulate breathing. Swallow: Spinal cord or brain injuries that affect the parts of the body that control swallow can leave patients without the ability to protect their airway. 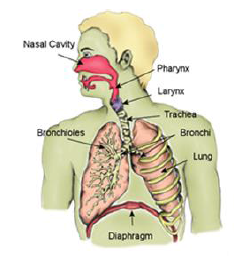 The respiratory system can sometimes go a little haywire if the nerves that control breathing are damaged. The lungs might overreact or underreact. They may make too many secretions or the airways and blood vessels may constrict when they need to dilate. We all produce mucus. But mucus can be a problem if you are unable to cough or have a weak cough. If someone is unable to clear the mucus form their lungs it can become infected and cause the tissues in the lungs to stick together. This puts people at risk for pneumonia. It is extremely important to keep the lungs healthy. Respiratory infection is the number one reason patients with cervical spinal cord injuries return to the hospital after being discharged from rehab. It is also the leading cause of death after these people are released back to home.